Natrozippeite: Mineral information, data and localities. Named in 1976 for its composition, with dominant sodium, and its relationship to Zippeite. This page provides mineralogical data about Natrozippeite. Parallel to flattening of grains. 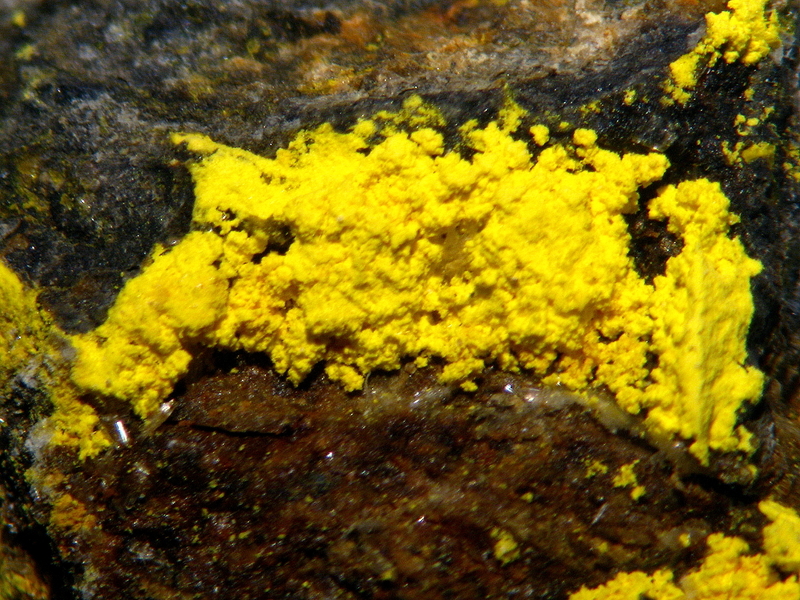 Found as earthy to velvety patches or crusts of earthy yellow mineral, rarely as micro-crystals. Reported as common, but no morphology given. Post-mine encrustation and/or supergene in origin. Nickelzippeite Ni2(UO2)6(SO4)3(OH)10 · 16H2O Mon. Marécottite 9 photos of Natrozippeite associated with Marécottite on mindat.org. Nickelzippeite 9 photos of Natrozippeite associated with Nickelzippeite on mindat.org. Gypsum 5 photos of Natrozippeite associated with Gypsum on mindat.org. Brochantite 3 photos of Natrozippeite associated with Brochantite on mindat.org. Zinczippeite 2 photos of Natrozippeite associated with Zinczippeite on mindat.org. Cuprite 1 photo of Natrozippeite associated with Cuprite on mindat.org. Pseudojohannite 1 photo of Natrozippeite associated with Pseudojohannite on mindat.org. Uraninite 1 photo of Natrozippeite associated with Uraninite on mindat.org. 7.EC.05 Nickelzippeite Ni2(UO2)6(SO4)3(OH)10 · 16H2O Mon. 7.EC.10 Rabejacite Ca(UO2)4(SO4)2(OH)6 · 6H2O Orth. 7.EC.20 Pseudojohannite Cu3(OH)2[(UO2)4(SO4)2]· 12H2O Tric. 31.10.4.4 Nickelzippeite Ni2(UO2)6(SO4)3(OH)10 · 16H2O Mon. 25.8.6 Stanleyite (V4+O)(SO4) · 6H2O Orth. 25.8.9 Uranopilite (UO2)6(SO4)O2(OH)6 · 14H2O Mon. Small amount of water (= 0.5 %) may be lost at 101 degrees C.
Frondel Clifford, Ito, Jun, Honea. Russell M., and Weeks, Alice M., (1976), Mineralogy of the Zippeite Group, Canadian Mineralogist: 14: 429-436. Gaines, Richard V., H. Catherine, W. Skinner, Eugene E. Foord, Brian Mason, Abraham Rosenzweig, Vandall King, (1997), Dana's New Mineralogy : The System of Mineralogy of James Dwight Dana and Edward Salisbury Dana: 661. Journal of the Czech Geological Society, Prague (1997): 42(4): 48. 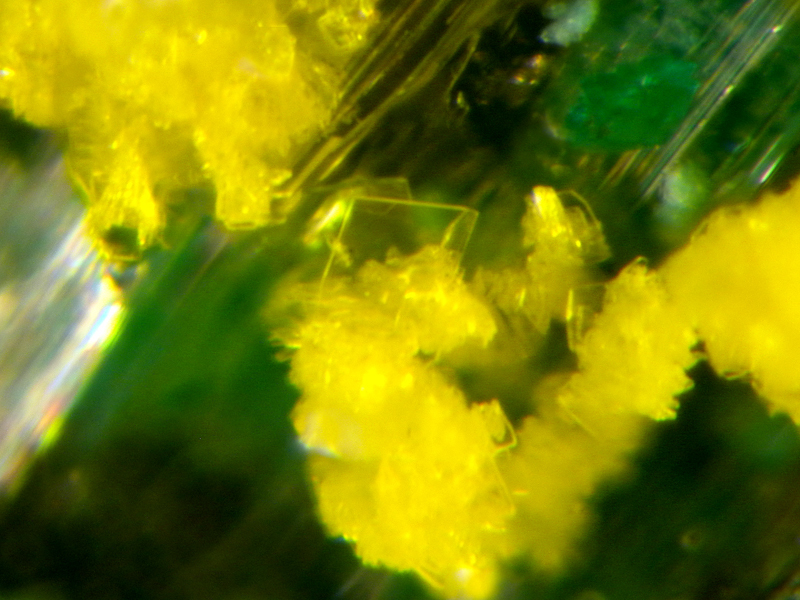 Burns, P.C., Deely, K.M., and Hayden, L.A. (2003): The crystals chemistry of the Zippeite group. Canadian Mineralogist 41(3), 687-706. Burns, P.C. (2005): U 6+ minerals and inorganic compounds: insights into an expanded structural hierarchy of crystal structures. Canadian Mineralogist 43, 1839-1894. Bridget E. McCollam (2002) ZIPPEITES: CHEMICAL CHARACTERIZATION AND POWDER X-RAY DIFFRACTION STUDIES OF SYNTHETIC AND NATURAL SAMPLES. MS Thesis, Notre Dame University. Števko M., Bačík P., Ozdín D., Zeman M., Jonáš J., 2010: Výskyt schrockingeritu na fluoritovom ložisku Vrchoslav v Krušných horách (Česká republika). Bull. mineral.-petrolog. Odd. Nár. Muz. (Praha), 18, 2, 99-105. J. Plášil, J. Hauser, V. Petříček, N. Meisser, S. J. Mills, R. Škoda, K. Fejfarová, J. Čejka, J. Sejkora, J. Hloušek, J.-M. Johannet, V. Machovič, and L. Lapčák (2012): Crystal structure and formula revision of deliensite, Fe[(UO2)2(SO4)2(OH)2](H2O)7. Mineralogical Magazine 76, 2837-2860. Števko M., Sejkora J., Plášil J. (2012): Supergénna uránová mineralizácia na ložisku Banská Štiavnica (Slovenská republika). Bull. mineral.-petrolog. Odd. Nár. Muz. (Praha), 20, 1, 110-120 (in Slovak with English abstract). Joan Abella i Creus and Joan Viñals i Olià (2012) NUEVOS MINERALES DE LA “MINA EUREKA”: METAMUNIRITA, SCHRÖCKINGERITA, BOLTWOODITA Y GORDAITA, CASTELL-ESTAÓ, LA TORRE DE CABDELLA, LLEIDA, ESPAÑA. - http://mineralsabella.blogspot.com.es/2012/06/nuevos-minerales-de-la-mina-eureka.html; Joy Desor ID by Raman spectroscopy. Anthony, J.W., et al (1995), Mineralogy of Arizona, 3rd.ed. : 375.
ⓘ Central City District ? Kasatkin, A.V., Plášil, J., Marty, J., Belakovskiy, D.I., Lykova, I.S. (2014): Nestolaite, CaSeO3·H2O, a new mineral from the Little Eva mine, Grand County, Utah, USA. Mineralogical Magazine, 78, 497-505. Kampf, A.R., Plášil, J., Kasatkin, A.V., Marty, J., Čejka, J. and Lapčák, L. (2015) Shumwayite, IMA 2015-058. CNMNC Newsletter No. 27, October 2015, page 1228; Mineralogical Magazine, 79, 1229–1236. Collected by Joe Marty, in the collection of Alex Earl; Kampf, A.R., Plášil, J., Kasatkin, A.V., Marty, J., and Čejka, J. 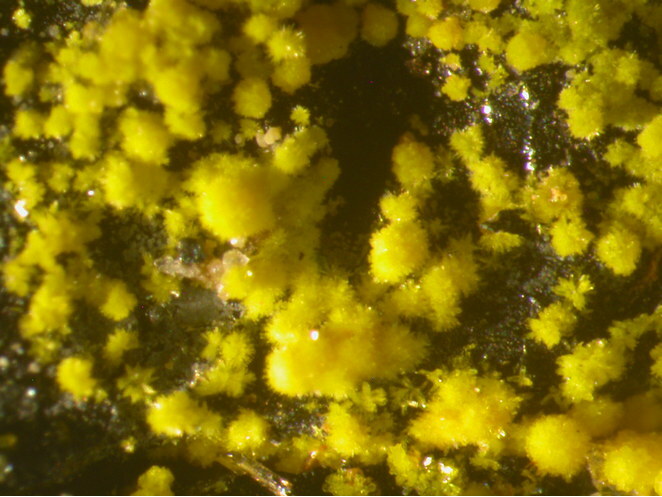 (2018) Markeyite, a new calcium uranyl carbonate mineral from the Markey mine, San Juan County, Utah, USA. Mineralogical Magazine, 82, 1089-1100. Jakub Plášil, Karla Fejfarová, Radek Škoda, Michal Dušek, Joe Marty and Jiří Čejka (2013): The crystal structure of magnesiozippeite, Mg[(UO2)2O2(SO4)](H2O)3.5, from East Saddle Mine, San Juan County, Utah (U.S.A.). Mineral. Petrol. 107, 211-219.